Running is an incredible sport that can be done anywhere, anytime. Running is one of the best types of exercise because is provides a great cardiovascular workout, while strengthening your muscles. Running also has other benefits related to mental health such as stress and anxiety reduction. The popularity of running in the U.S. continues to grow with more and more people starting to train for their first race. 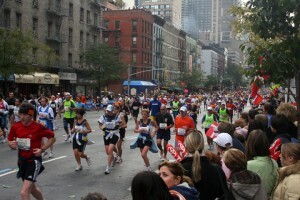 We know of several participants who have participated in marathons and other running events during their J-1 programs. Since arriving to the U.S., how many of you have gotten involved with running? This blog is designed to give an introduction to running culture in the U.S. and provide some resources for those of you looking to get more involved. During the 1972 Munich Olympics, Frank Shorter became the first American to win the Olympic marathon in 1908. Televised so the entire country could witness this landmark win, that race marked the beginning of a running boom in the United States. Distance running became something more than an event for elite athletes. Since that gold medal win, running has gained immense popularity and today many people call themselves distance runners. Soon after the 1972 marathon, celebrities and political figures began to take up running as a recreational activity that popularized the movement ever further. Once running was deemed an effective way to stay in shape and burn calories, people also began running to lose weight. To meet the growing interest in running, athletic brands like Nike, Adidas and ASICS have increased their distance running gear and shoes, and other running-specific companies like Brooks and Saucony have formed. 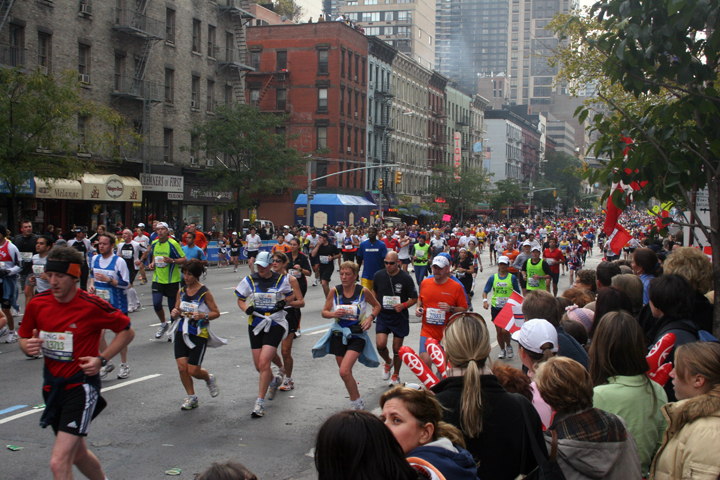 Charity running is becoming another popular trend in running history. Instead of running a race just for the personal accomplishment, you can run a race and support a charity as well. The InterExchange team recently participated in the 2014 American Heart Association Heart Walk in New York. Use the website Run for Charity to find a charity run nearest you! Running can be a great way to meet new people and see new places while in the U.S. Local running clubs exist in most cities and can be a great way to meet new people and participate in a group workout. Some running clubs are free, while others might have an annual fee. Running stores like Nike and Lululemon, and other local stores, organize free weekly group runs. If you want more of a distance running commitment, there are also organizations that offer specific training programs, which can last anywhere from a couple weeks to five months, depending on your race. Check out the resources below to look up training programs and running stores. Popular Races in the U.S. The Color Run: Called the "Happiest 5k on the Planet", racers start the race wearing all-white, and finish covered in color. Each kilometer features a different color blast zone. Rock 'n' Roll Marathon Series: This series includes races of different lengths from 5k's to full marathons with one thing in common: live bands rocking out along the course. Warrior Dash: This popular obstacle race is usually three to four miles long with about 25 obstacles. Oh yeah, and there's lots of mud. For an even bigger challenge, check out the Tough Mudder. Runner's World: Website of the popular magazine that features everything you need from shoe reviews to training plans. Also great for finding races, and race reports. Running Competitor: Website of running magazine that includes reviews, articles, advice on nutrition and more. Hal Higdon: A legend in running communities. Hal is a Runner's World magazine writer, and answers running questions and provides excellent training programs. His training programs have helped many people complete their first half marathon and marathon. Happy Running, Career Training USA!